Five Palestinians died and at least 150 were injured by Israeli live fire and rubber-coated steel bullets in the occupied Palestinian territory on Friday, the Palestinian ministry of health said. 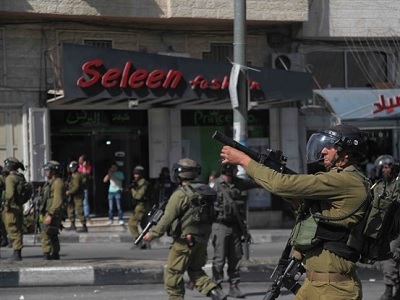 Head of the ambulance and emergency department in Bethlehem, Muhammad Awad, told Ma’an that three youths were injured by live fire in the legs, five with rubber-coated steel bullets, and four suffered from severe tear gas inhalation. The injured were transferred to the Palestine Medical Center in Ramallah, and photojournalist Muhammad al-Arouri — injured with a rubber-coated steel bullet in the leg — was aided on scene by Red Crescent medics, locals told Ma’an. An Israeli army spokesperson told Ma’an that in al-Bireh and Bethlehem areas, “rioters” rolled burning tires and hurled rocks at Israeli forces, who responded with “riot-dispersal means.” In al-Bireh, the spokesperson said that .22 caliber rounds were fired at the “main instigators,” while rubber-coated steel bullets were fired at demonstrators in Bethlehem. Locals told Ma’an that the forces chased protesters between olive trees and caused dozens of Palestinians, Israeli and international activists to suffer from tear-gas inhalation. Following Palestinian attacks that have left seven Israelis dead since the beginning of the month, Israeli Prime Minister Benjamin Netanyahu launched several punitive measures — labelled collective punishment by rights groups — across occupied East Jerusalem, the West Bank, and Gaza Strip in alleged efforts to quell violence. Hamas leader Ismael Haniyeh called on Friday for the “intifada to continue,” while the Palestinian Authority has rejected the claim that the territory has entered a long term uprising, insisting that the wave of violence can be controlled and peace restored.